Gelarti is the fun way to paint and create your own reusable stickers. Choose your design and then use the special Gelarti paint to bring them to life. Once they're dry, decorate walls, windows, stationery and more. 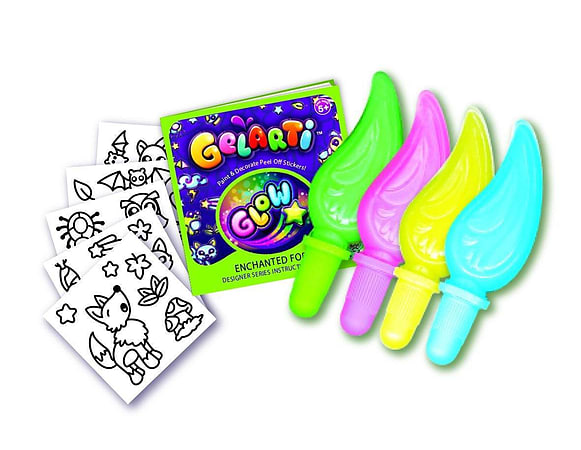 Now your Gelarti stickers can even Glow in the Dark. Create a glow in the dark Enchanted Forest on your wall, windows and more with Gelarti! Colour in forest characters and scene elements and bring them to life with a bit of Gelarti glow in the dark magic. Choose your design out of the 25+ stickers in the pack, then use the special Gelarti paint to bring them to glowing life!